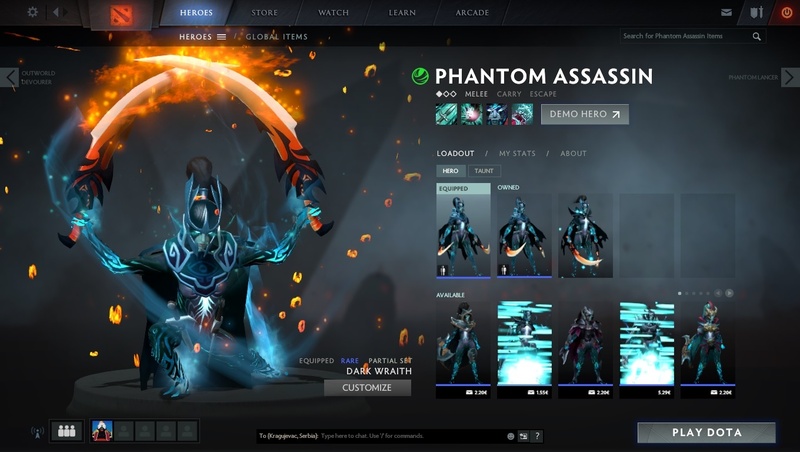 This is Dota 2 Phantom Assassin Manifold Paradox Arcana mod provided by fb.com/ShadyModDota2. Preview image is below the text. Thank you so very much I have been waiting for this mod for a very long time. It might be due to your resolution or inventory being in left side, I am not sure. Admin ,,, How to uninstall it? me too ! 🙁 after a couple time in game this glowing came ! How to Invisible the Old Blade when i get Ulti? override vpk not working, how we do? How To Install It Plsss??? icon not showing? how to fix it? How to Install guys? already extracted it. Sorry , I forgot to mention the following: To operate the mods should put the ” -override_vpk ” command in the startup options Dota 2. If you do not know how to explain it to you. Should press the right mouse button on the icon gives 2, then press the left button on Properties, and click Set launch options. Inside the window write or paste command (if you have other commands leaves room for it to work). Again, sorry for the bad English and thanks for reading. Does this have no mistakes now? Not yet. If you are unsure if the mod is updated for reborn, check it’s date. If it is 2015-09-15 or after this date, mod will work. She is just like a statue…not a live hero. Working, but after some time, the model animation “duplicates”, when PA attacks, i can see a lot of models doing different attack animations. I installed this mod exactly like intended to, no other PA skins or any other hero in fact, just this PA arcana BUT the character has purple legs (texture glitch), the particle effects are missing, when skilled Blur and with it active, PA seems to morph into 3 disgustingly horrifying upper torso, all the crit effect is horribly bugged out aaaand.. in the Hero Selection screen, her blades are just.. stuck.. in the ground..? I tried restarting the game, steam, my pc, reinstalling, redownloading and reinstalling but to no avail..
Verify Integrity of Game Cache. This mod is flawed. There’s no animation, both in “Hero” viewing, and in game. Plzzzz , she’s so perfect , do something !!! Just like a statue , nothing more . in shadymod, the manifold paradox arcana is working. update plz. This arcana make me laugh…i see swords without fire and ugly…can u fix? in game, does PA raise her sword when she’s nearing enemy?